If Eric Bana asked u out on a datum what would u do? a pop quiz question was toegevoegd: What race did Eric Bana, Peter Hill, and Simon Middleton finish in P13 from P27 on Sunday, February 9, 2014? a comment was made to the poll: The Hottest character: Henry VIII of Hector? a comment was made to the poll: If Eric Bana asked u out on a datum what would u do? 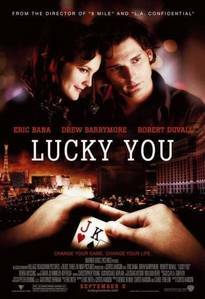 What is the name of his character in "Lucky You"?